I'd like to add one last thing about my little break. I got to spend time with a real friend; I haven't seen a real friend in a long time. That is the hardest thing about this trip. I spent the Sabbath couch surfing just outside of Genova. My host was extremely friendly and a kayaker himself. By the time I got to my boat and had it in the water it was noon. 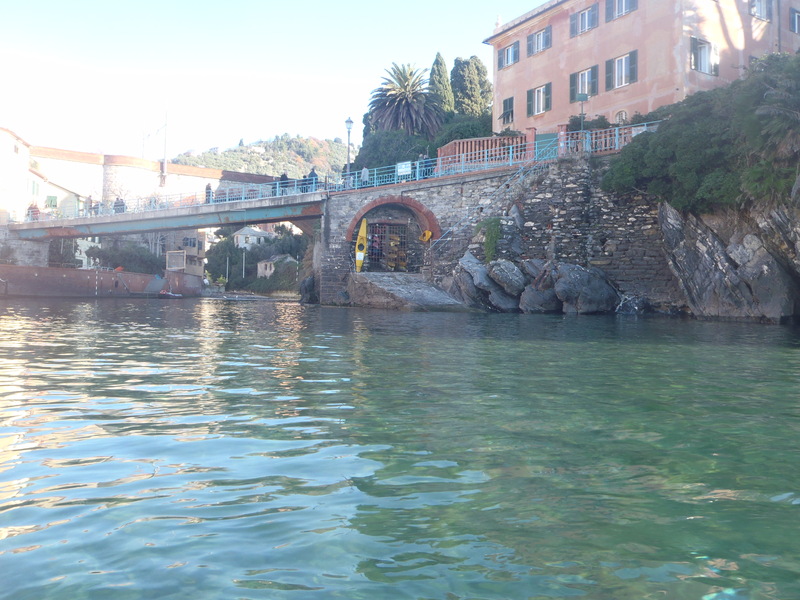 So today I paddled to Nervi. The weather was just as I'd left it, cloudy with a headwind. Though the headwind wasn't as bad as it had been. 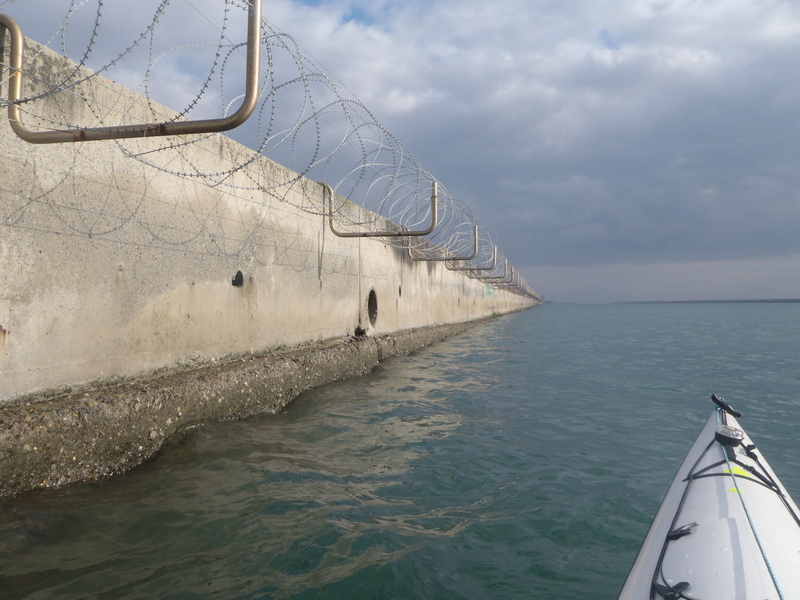 There is a seawall running parallel to the mainland for several kilometers in front of Genova. It effectively creates a long wide lane of calmer water for large cargo ships. I asked one of the mooring men at the port I was leaving if this lane had an outlet at the far end. He assured me that it did but said that it was closed to smaller vessels and that if I went that way the Coast Guard would have a conniption. He reiterated several times that it would be dangerous for me to take the path. So far* I hadn't been able to attract the Coast Guard’s attention, even when trying on my radio. I launched. Passing the entrance to the path, I thought it wouldn't hurt to take a look. The lane was wide enough for two tankers to pass side by side and still leave room for a kayak. I took the lane, and it turned out to be the biggest mistake I made today. What started off as a weak current against me quickly turned into a strong one. The large concrete walls effectively created a wind tunnel effect, so that while I was not paddling directly into the wind, as far as the current in this place was concerned, I was. But other than my slow progress and my industrial barbed wire view, it was fine. A boat did come in the opposite direction, but it wasn't much bigger than mine. At the first opportunity I was out of the lane and onto fairly flat open waters making much better time, though my view of land was still of a large seawall. There are many moored tankers in this area, and the view of the seawall and Genova's towering industry behind it made this to be a less pleasant place then most others. I forgot to set up my new lure today, so naturally there were lots of fish splashing around. At least one of them was a few feet long. A whole school jumped over my boat, or at least tried. Many of them thunked against my hull and fell back into the water. One of them hit my arm, and a few lucky ones made it over. I wonder if this was the kayaking equivalent of hitting a deer on the road in the night. If so, I'm terribly sorry. I had seen that Nervi had a port on Google maps, but I hadn't plugged it into my GPS and it wasn't on my chart, so I asked an old fisherman on a rowboat for directions. It was the first old school rowboat I have seen on this trip, and I thought there was a certain comraderie between us non-motor mariners. But he didn't speak English and started paddling away as I attempted to question him about the area in Italian. Finally I got to the port I had been aiming for. I would find the offices, tell them my story, and maybe score a place to sleep and a shower. Except the port was almost empty of boats. There would be no office or showers, this was a public port used only by a handful of fisherman this time of year. The port was surrounded on three sides by Nervi. Cliffs with small staircases winding up them or bars and restaurants. At one end it was fed by a stream. Atop one small steep boat ramp there was an old stone arch and open gate. On either side of the arch a kayak was mounted on the side of the rock face. The gate was open. I found in the kayaking club a couple of kayakers who had just finished an afternoon paddle. They kindly invited me to use the club’s showers and sleep here overnight. The Nervi kayak club rocks! I was told “This is Italy!” rather rudely and I couldn't expect people to speak English. In my defense, I had looked up on-line how to say “Wi-Fi” in Italian and was assured that it already was. Apparently the woman didn't know about wireless Internet. It seems to me that obnoxious people should be required by law to dunk their heads in a bucket of cold water. **Everything is closed on Sundays. you had your chance to catch a fish, with your bare hands, and you say "Im sorry"
i was thinking if you learn to say "i paddled from Barcelona" in every language, as your greeting, you might instantly earn respect. I'm always working to further improve my Italian. Most people ignore me when I say that. They think they don't understand. People are trained to dismiss the ridiculous.